On your final day in Budapest, you may want to just wander the streets of Pest, finding architectural gems along the way and making your way to some of the sights you haven't visited. Some other highlights include the National Museum, the Opera House, and of course, the incredible neo-Gothic Parliament building. 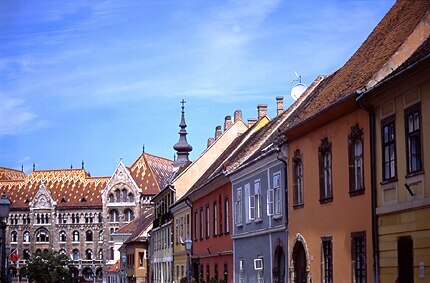 Another option is to spend your final day taking a day trip to the small, picturesque town of Szentendre. Just 12 miles north of Budapest, it's a 40-minute trip from the Batthyány tér HÉV train station. The town has a tumultuous past. Serbian and Greek refugees originally settled here during the 14th century in an attempt to escape Turkish forces. Although occupation and upheaval typified daily life in Szentendre until the late 17th century, the community managed to retain its traditional Orthodox beliefs by gathering in simple wooden churches to worship. During the Habsburg era, a more liberal attitude allowed the freedom to worship without restriction. Eventually, the Serbs were required to swear an oath of allegiance to Hungary resulting in many leaving. Today, Szentendre draws a significant tourist crowd, because of its proximity to Budapest. There are a number of tiny, but interesting museums and a vibrant art scene that started with the arrival of artists in the 1920s. Fö tér is the town's main square where various streets leading away from this square offer numerous shops for souvenirs, ranging from traditional lace to communist memorabilia. More interesting than the tourist shops, though, are the town's buildings, art exhibitions, and museums. Take note that the museums have irregular operating hours, regardless of what is posted on the door. However, if one is closed, there are plenty of others to visit. Surely you will want to climb to the top of the hill to see the Serbian Ecclesiastical History Collection. The ladies who run the museum will then unlock the church next door for you to visit. The Margit Kovács Museum features the work of Hungary 's most well-known ceramicist (and one of the first artists to arrive here in the 1920s). You are sure to find other museums and sights of interest as wandering through the streets are an adventure. Make sure you walk to the river to see the Danube Bend in a magnificently picturesque panorama. You'll want more than just a slice of cake after visiting several of the town's museums, so make your way to Régimódi for a full meal. Near the central square, this beautifully decorated establishment offers a menu of Hungarian specialties with a focus on game dishes. For more information, visit the Budapest Tourism Office at www.budapestinfo.hu.